Food is part of my color scheme of life. 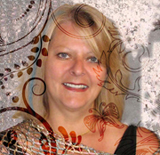 I cannot live without colorful and flavorful food presented well, even if I am eating alone. Eyes want to see beautiful things to send a message of happiness to the brain. It doesn’t take much efforts to do something special for ourselves. I am not a vegetarian and yet my every day food seem to reflect that style of eating. As soon as I was weaned, my parents taught me to eat everything without distinction and to waste no food. That concept has been good and alive in my life, every where I lived in the world. I have discovered that in countries different from mine, people eat the same vegetable, often prepared the same way, but, also, I have discovered new vegetables, new flavour and new ways of cooking vegetables. My repertoire of earthy food is getting so big, I don’t have enough days in a year to cook them all. For the moment, enjoy these three simple and so tasty recipes from my kitchen as much as I enjoy them. 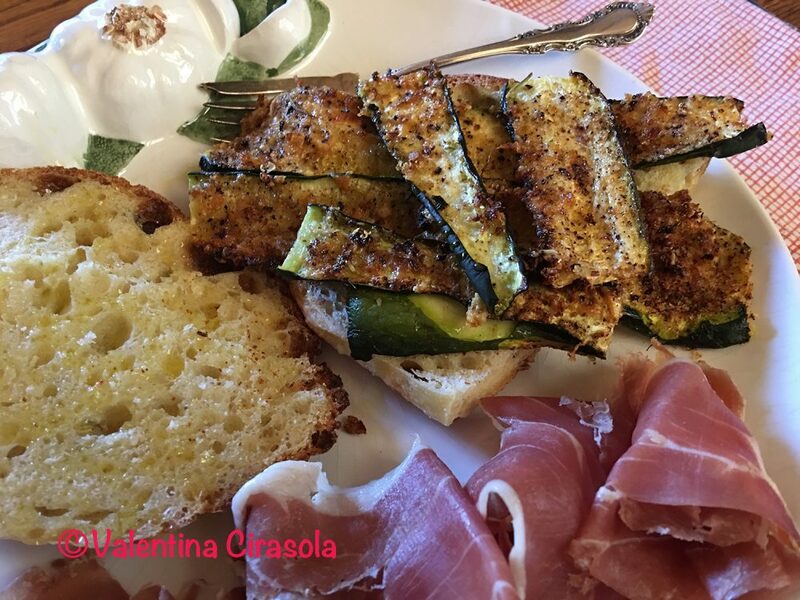 A sandwich to die for – Grilled Zucchini and Italian Prosciutto. Thinly slice zucchini, align them on a parchment paper over a baking sheet. On each zucchini slice, add finely chopped garlic and ginger, Parmigiano cheese, olive oil, salt, pepper and bread crumbs. Bake at 400 F. until golden brown, about 20-30 minutes. Brush a small amount of olive oil on each bread slices and grill them (I made my country-style bread). Assemble the sandwich with Italian prosciutto. I did not add anything else, it is tasty enough as is. 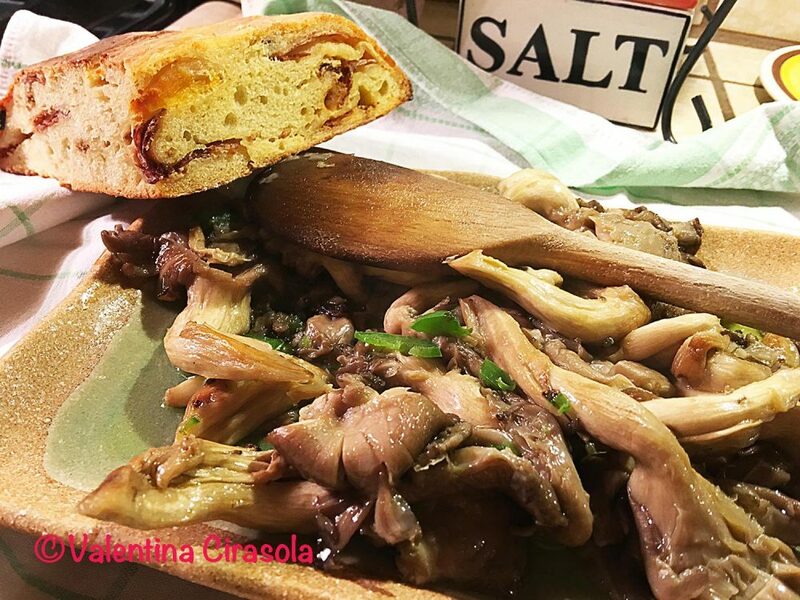 What do you say about a plate of oyster mushroom? I adore this dish, whether it is made for a healthy lunch, with a piece of bread and a glass of red wine, or as a side dish to go with an entrée of meat or fish. Brush off impurities from the mushroom, or cut them off (if you wash mushrooms in water, they will exude water in the cooking). Finely chopped garlic and chili pepper, if you like it, briefly sauté in olive oil, then add mushroom and continue to sauté until soft, about 10 minutes. Add chopped Italian parsley to finish. It is a real delicacy! In Italy we call this sandwich “Mozzarella In Carrozza” translated is Mozzarella In A Chariot. Beat some eggs, depending on how many sandwiches you are making. Season the eggs with salt and pepper. Warm up an iron skillet brushed with some olive oil, or butter. Slice mozzarella in thin pieces. Dip each side of the sliced bread in the eggs. 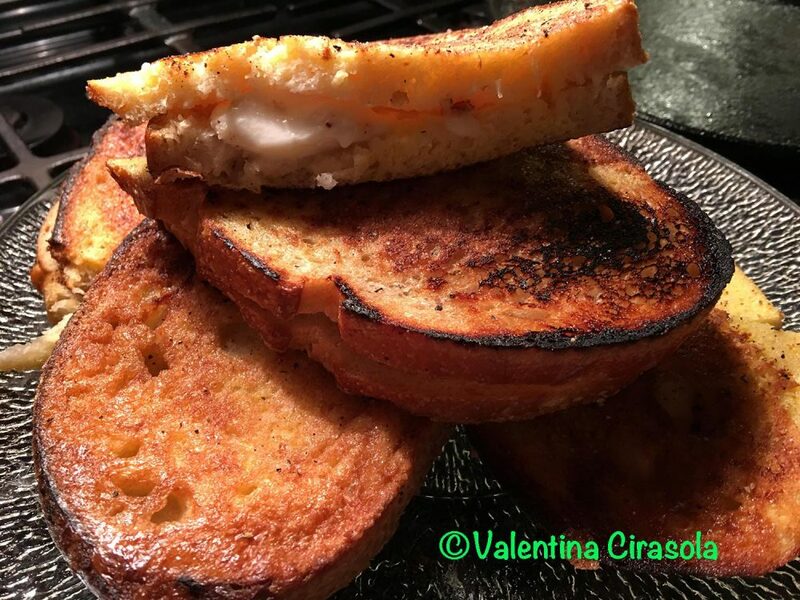 Lay on the hot pan, each slice of bread one at a time, then mozzarella slices on top, close the sandwich with the top bread slices also dipped in the eggs. With a spatula push down gently on the sandwich to allow mozzarella to stick to the bread. Brown one side of the sandwiches until crisp, carefully turned with the spatula, brown and crisp the other side. There you have it, three simple lunches, easy, inexpensive, healthy and tasty, that you will want to repeat often. This kind of food is only found in Italian homes, not in restaurants. The food does look tasty, Valentina. Happy weekend hugs. …and they are really good. Happy weekend to you as well, Teagan.